Any disease can ruin a beautiful day. However, nothing is as more ruinous than having an allergy. Allergies are one of those diseases that can strike from nowhere. Allergic diseases are caused by a hypersensitive immune system in reaction to different factors. These factors are usually harmless substances in the environment. You may also see free action plan templates. One moment you are frolicking in the grass and next, you are itching all over. Substances that may provoke and cause allergic reactions are called allergens. These allergens can come in the form of pollen, certain foodstuff, metals, insect stings and bites and medications. You may also see free plan templates. 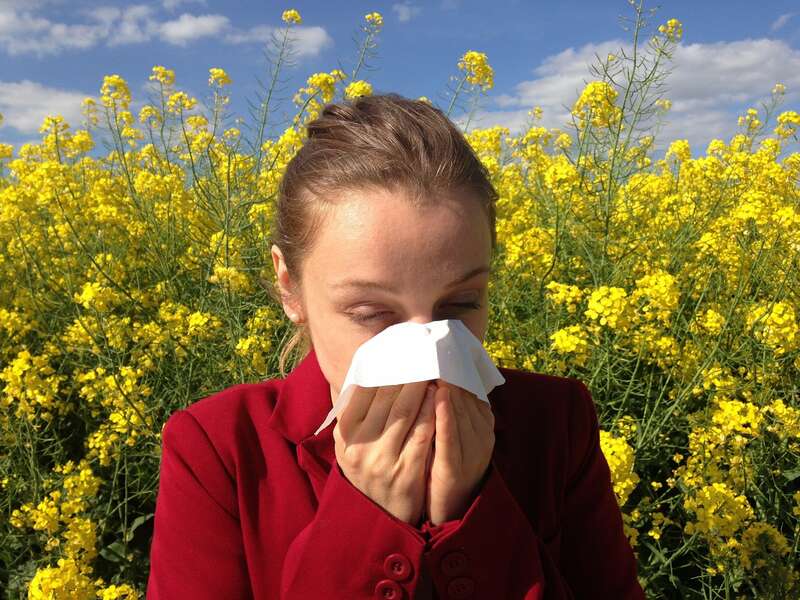 Allergies affect everyone, however, they are especially prevalent among women and children. Symptoms of having an allergic disease are the reddening of the eyes (also known as allergic conjunctivitis), an itchy rash, sneezing, rhinorrhea, and the shortness of breath. Allergic diseases can take the form of a hay fever, food allergies, atopic dermatitis, allergic asthma, and anaphylaxis. It is imperative for anyone to take all allergic diseases seriously even if some may not look as severe. Allergic diseases such as allergic asthma and anaphylaxis can be fatal if not treated instantly. Food intolerance and food poisoning are not allergic diseases. Allergies can cause a lot of undue to stress to anybody who has them. Activities such as starting schools, changing jobs, enrolling in camps, and other extracurricular activities are already stressful enough. If you or someone you know has a life-threatening allergy and has to do any of the above-mentioned activities, you can be sure that their stress levels are at an all-time high. You may also see team action plans. Having an allergy action plan can help alleviate some of the stress they feel. 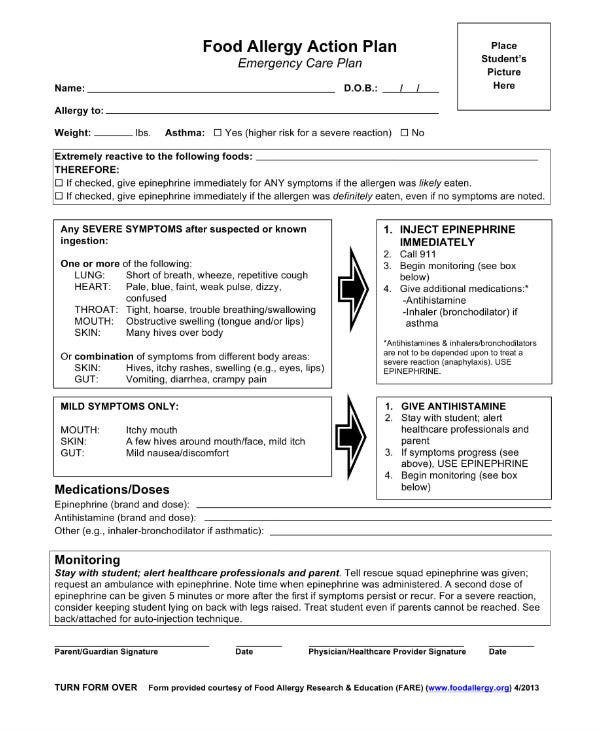 Allergy action plans are medical documents that can help manage somebody’s allergies. They can detail the common allergens that trigger a patient’s allergy and they can include policies and emergency treatments that should be administered to a patient (usually as prescribed by the person’s physician) in case of an allergic reaction. 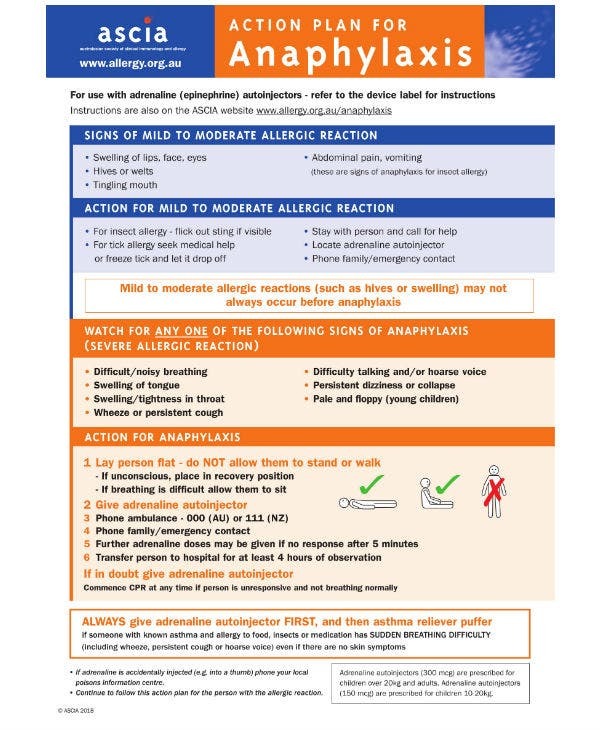 You may also see allergy action plan samples. Who Should Write and Update the Allergy Action Plan? Allergy action plans should be developed, completed, and signed by the patient’s medical doctor. If there is any need for a copy of the said action plan, the original signed copy should be scanned and copied. Allergy action plans should be reviewed when the patient is reassessed by their doctor and if they are given new treatment plans. Who Should be Given a Copy of the Allergy Action Plan? 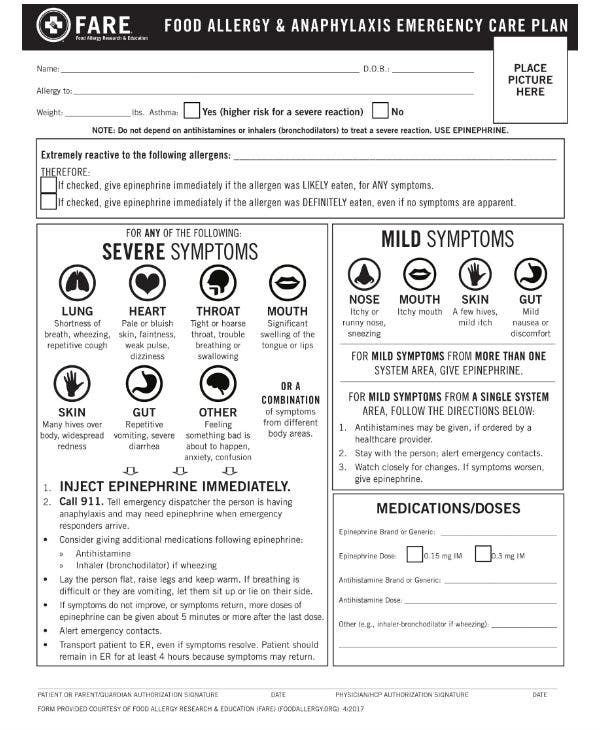 An allergy action plan is given to the patient to help him manage his allergies. A copy should be given to other concerned parties that may be directly involved with the patient especially if said patient is a child. Parents should have a copy so that they can review them with the patient. You may also see school action plans. 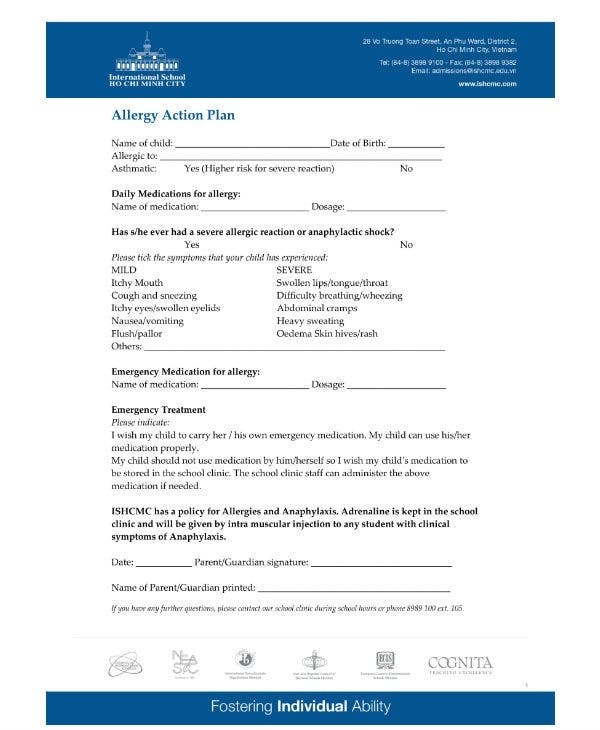 In the case of allergy action plans for child patients, copies should be shared with caregivers, schools, and other child care facilities. 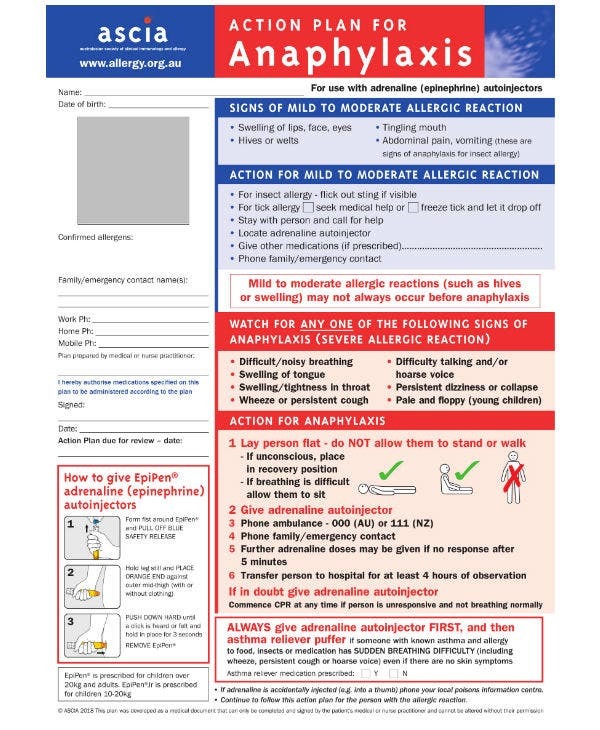 Allergy action plans can be updated and as such, it is also imperative that these people will be given a copy whenever the allergy action plan is updated. You may also see developing a business action plans. As stated above allergy action plans should be done and filled up by the patient’s doctor. As there may not be a universal format for an allergy action plan, it is important to know which are key information to include in the action plan. You may also see business action plans. 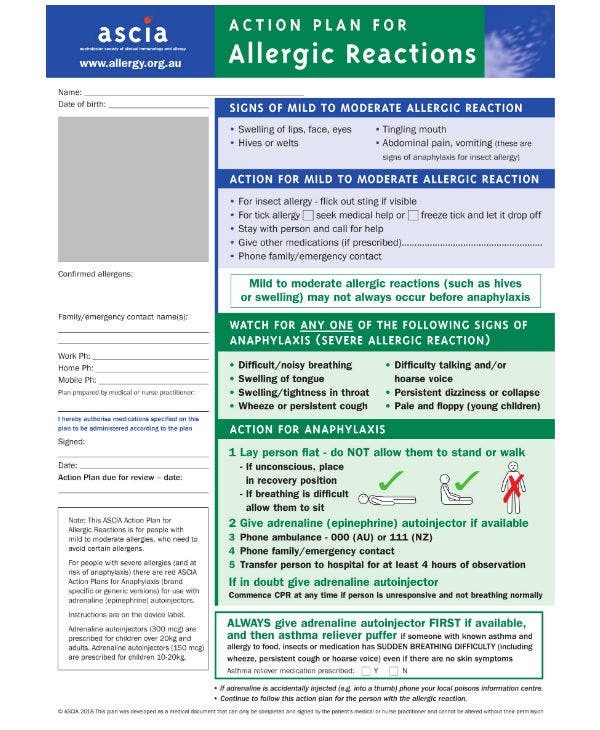 Any allergy action plan includes a picture of the patient who is the subject of the plan. Such information should be placed along with the patient’s name, date of birth, and age. A photo of the patient should be included especially if said patient is a child. Allergies can be triggered at any time. You may also see sample strategic action plans. If we take a child as our patient for example, in a school setting, we will not always be sure if the teacher knows the name and face of the child. This person could be new at his job, a temporary, or a substitute. No matter what he or she is, chances are he or she will not be able to put a name to the face. A photograph of the patient is essential to be able to quickly match the action plan to the corresponding patient. With a quick match comes a quick response, furthering the patient from danger or possible fatality. 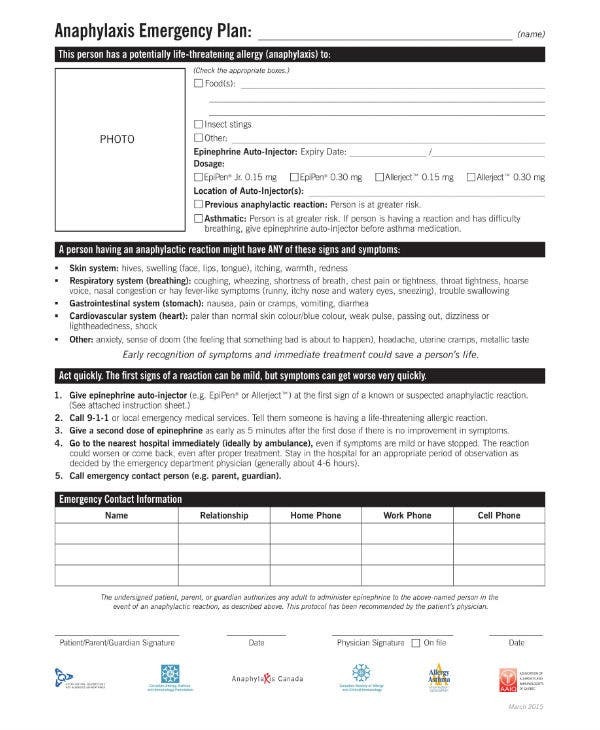 Simply put, a picture in the allergy action plan allows everyone to know which patient has which allergy. You may also see training action plans. The allergic history of the patient can provide additional information about the patient’s condition. 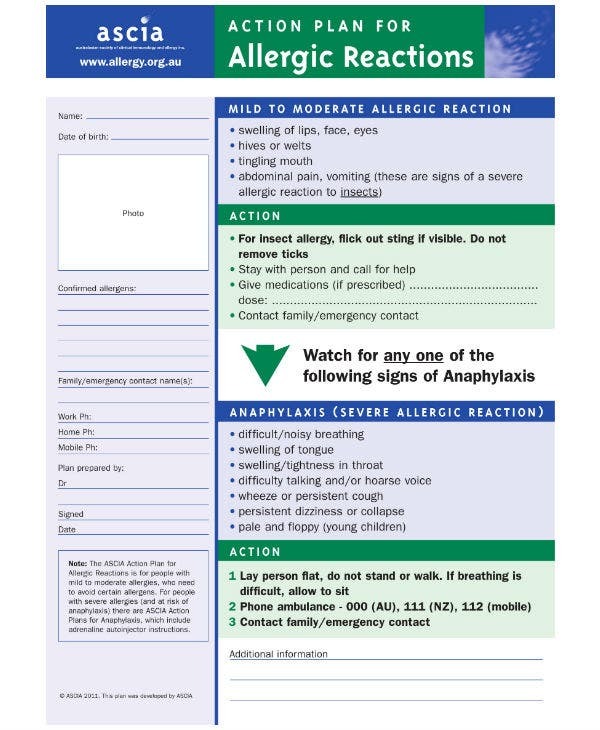 This information can also include the patient’s allergic information. Such information will be very important for the patient in order to avoid future contact with these allergens. You may also see risk action plans. Further information to include in this section would be the patient’s history of asthma and anaphylaxis. For patients with asthma, the asthma action plan and treatment could be enough treatment in mild cases. This decision and distinction can easily be made through the patient’s allergic history. 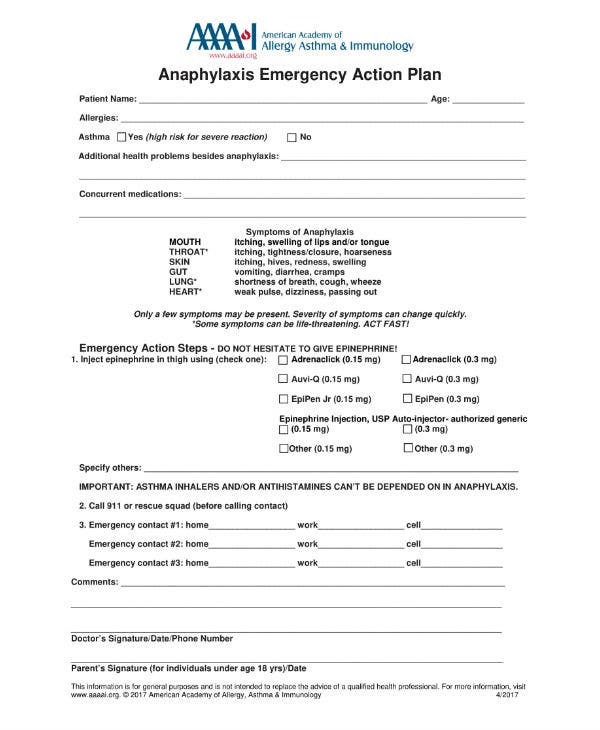 Just as with other medical action plans, having an emergency contact list in your allergy action plan is extremely important. The contact numbers of caretakers, parents (in case of children), spouse (if married), and the medical professional should be included to easily contact them in case of emergencies. These people are the ones who will be affected in case of emergency and as such, they should be contacted immediately. 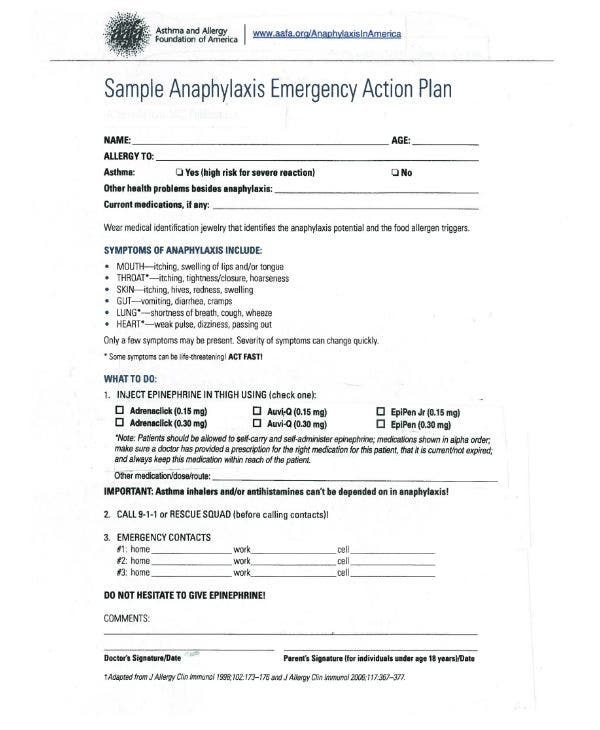 An sample allergy action plan is usually placed together with the patient’s medication. It is important to have the patient’s medication list in his action plan to let the people know which medicine is which and for what. This will provide a quick response time especially in emergency situations and sudden allergic attacks. The dosage of each medication should be specified clearly so that the patient will be given the correct one and to avoid overdosage and lack of it. Furthermore, it is important to specify the methods of applying said medications to the patients. Some patients are prescribed with an adrenaline auto-injector. As such, a guide on how to administer should prove to be very helpful. Remember though that all medication that is included on the patient’s medication list should be approved and prescribed by the patient’s doctor. You may also see create an action plans. 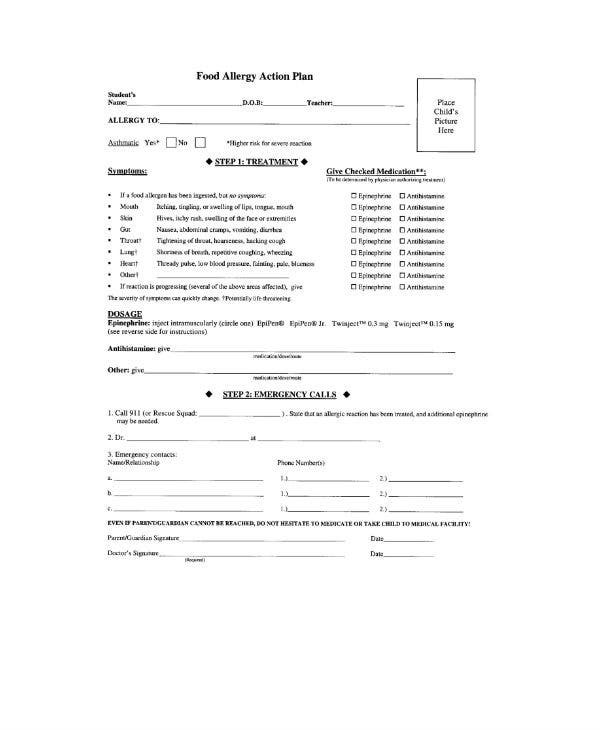 For people who are suffering from allergies, an allergy action plan is a godsend. It is an essential tool for managing the disease, thus at least removing a bit of stress in their day to day lives. An allergy action plan can empower the patient as they are confident that they have enough information and correct medication in case of sudden allergic attacks. You may also see word action plans. One of the surest ways to prevent an allergic reaction is to avoid the allergens that caused it in the first place. 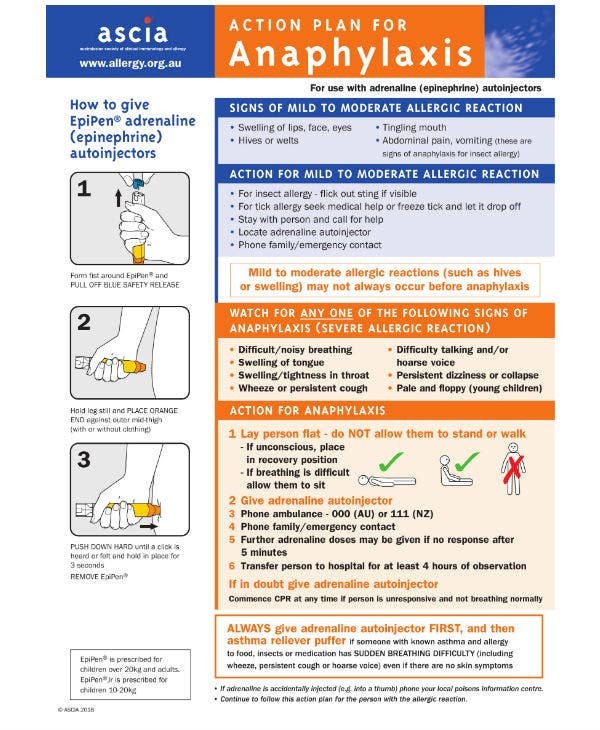 An allergy action plan with a list of the patient’s allergy triggers allows the patient and other people to have the knowledge of which substance should the patient be a close proximity too. You may also see student action plans. It is important to be sure if there is an allergic reaction before administering medication. The allergy’s symptoms can be included in the action plan so that it would be easier to identify the signs of allergy and its severity. With the symptoms known, the proper care and treatment will be given accordingly. You may also see smart action plan templates. Allergic reactions can range from mild and severe. With the description of the patient’s symptoms, the person who will be helping the patient can easily administer the correct treatment. It can help him decide which medication should he give to the patient. Without such details, it would be easy to give the wrong or insufficient medication. Such error may result in negative effects on the patient. 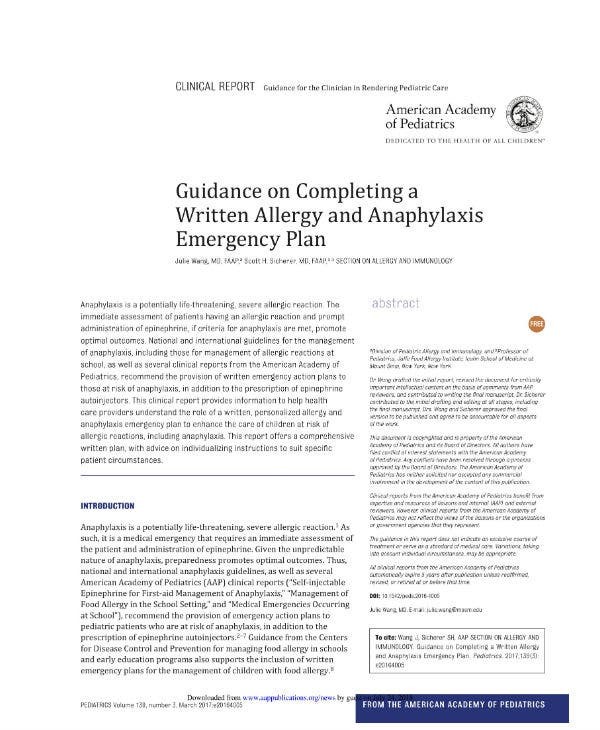 A clear allergy action plan will help prevent a lack of dosage and overdosage and in addition will be an efficient use of the patient’s medication. You may also see project action plans. The allergy action plan is not only a tool for the patient. The plan can also help doctors and other health care providers to give a more proper care for the treatment of the patient’s allergies. With the use of the allergy action plan, health care professionals will have the opportunity to individualize the patient’s treatment plan. This free treatment plan can be based according to the patient’s history, family input, and local regulations. National and international organizations that concern themselves on allergies are in full support of written allergy action plan. 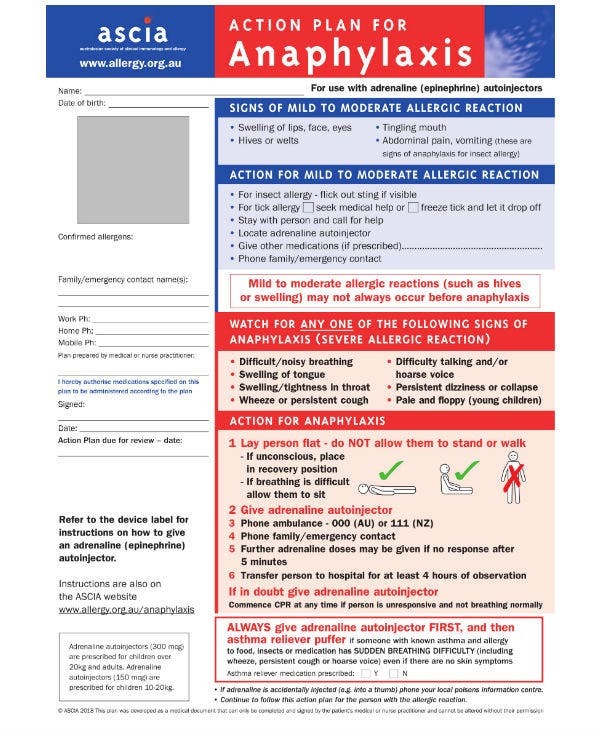 Organizations such as the Australasian Society of Clinical Immunology and Allergy (ASCIA) even have their own allergy and anaphylaxis action plan format. These organizations believe that written allergy action plans will enhance the lives of the people affected by allergies, especially children. However, there are numerous plans out there. This number can prove to be confusing. This confusion is usually caused by their difference in content and treatment recommendations. A universal format will be needed in order to eradicate and avoid this confusion. 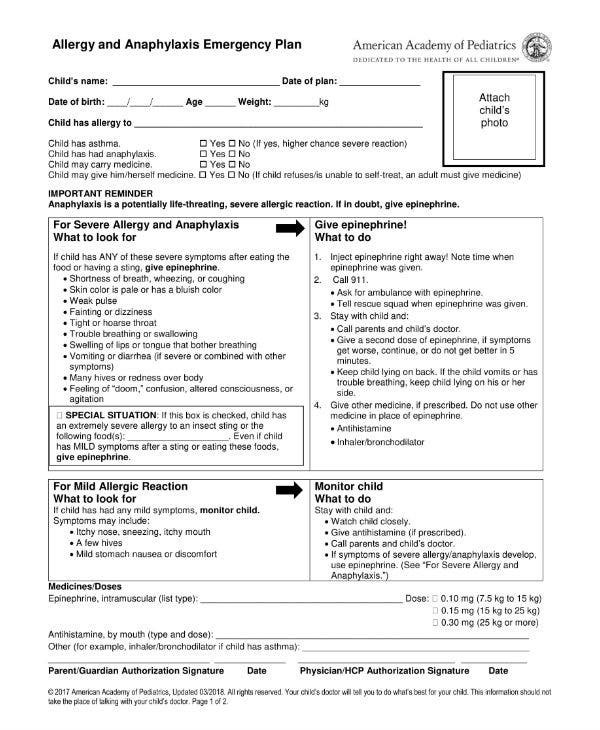 Such formats should take into account several aspects of allergy and anaphylaxis emergency care. Such format should include a description of signs and symptoms and the proper treatment. If such format will be finalized, errors in emergency allergy treatment will be greatly reduced. You may also see incident action plans.